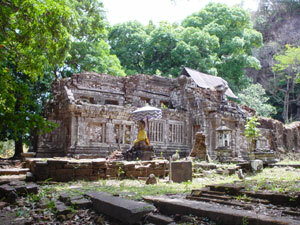 Wat Phu is situated on the Phu Passak slope 12 kilometers away from Champassak City. It dates back to the Chenla Period (6th to 8th centuries) and was later part of the Khmer Angkor Empire (9th to 13th centuries). A temple complex whose approach is laid out upon a very long, usually east-west, axis. The traditional festival of Wat Phu is celebrated annually during the full Moon of February and organized before the Anger’s ceremony.